Finally, a rain-spattered Sunday. The perfect kind of day for hot chicken wings. Clouds like floating African elephants hang low over my windows, threatening to crash down any moment. Think of a water filled plastic bag, ready to burst. Love it. All summer, burning eyes peeled on the dry blue skies, we waited for the faintest sign of moisture. Exhausted by bright, hot sunshine, spirits withering, we endured the blistering days. So waking up to drama in the sky puts a spring in my step and I make plans to watch the rain with something hot and spicy on my plate. 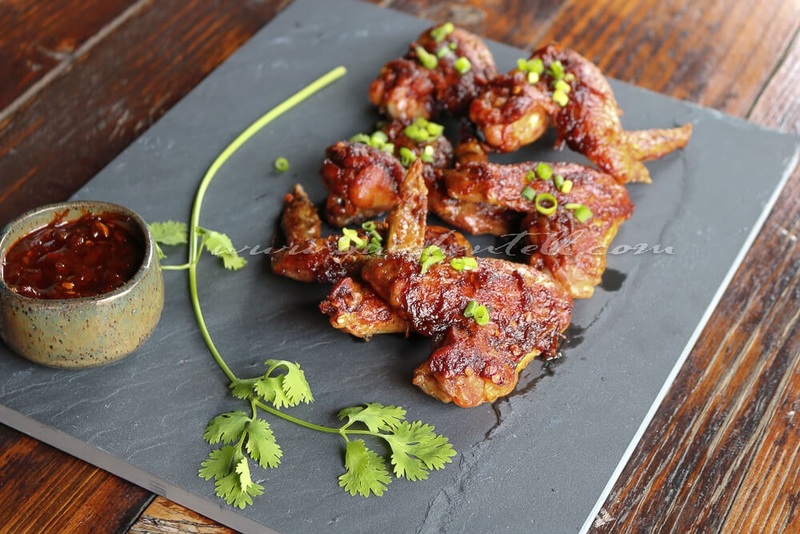 Crispy, juicy chicken wings crimson with chilli paste and sticky with sweet caramelised bits, I know will hit the spot. Requiring minimal effort (making the sauce is the only real work involved), these chicken wings look and taste like hours of effort has gone into them. My family likes the hot stuff, but the amount of chillies is entirely flexible. 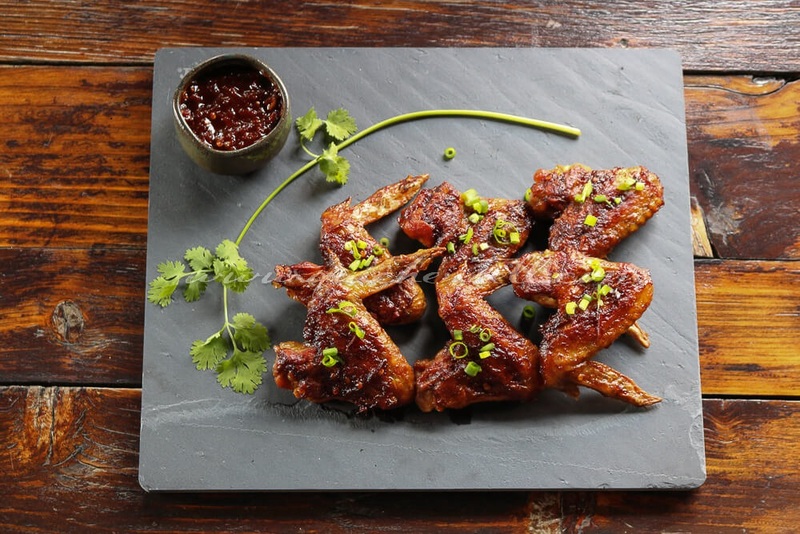 When it comes to chicken wings, the sauce is the star that makes all the difference. I want my sauce to combine different Asian elements and create a punchy flavour. The kind that would make me lick every bit of sauce off my fingers and leave its scent on my brain to salivate over later. 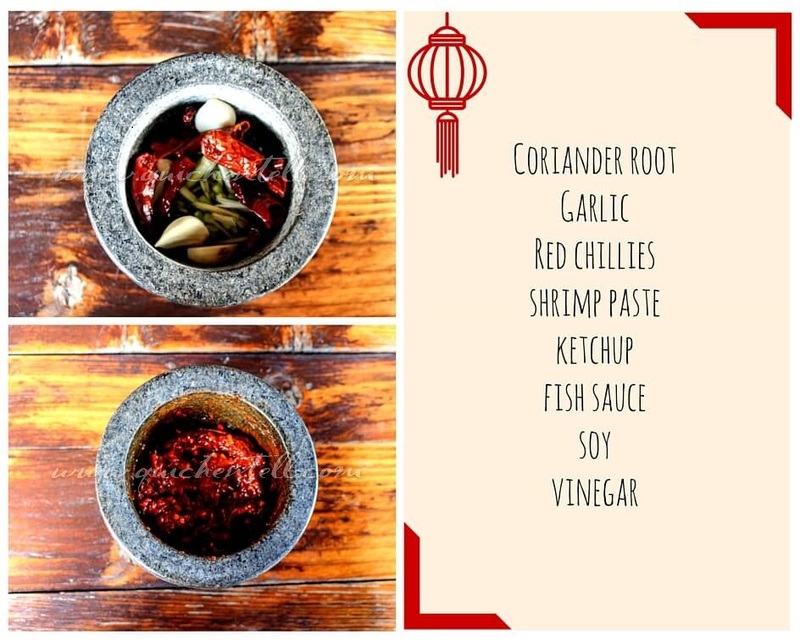 And the combination of red chillies, coriander stems, garlic, Thai sweet chilli-shrimp paste (nam prik pao), tomato ketchup, dark soy, vinegar and fish sauce (nam pla) really build that deep, deep character into the sauce. A mortar and pestle are the perfect tools to make a thick, pulpy sauce (that if required, can be diluted for basting and dipping). The slightly coarse texture also helps it adhere better to the chicken. More than anything else, I think, the full-bodied, fragrant flavour that results from pounding ingredients by hand can only be achieved with a mortar. So once the sauce is done (took me all of 7-10 minutes), all I have to do is grill the chicken for 20 minutes on each side, before giving them a generous slathering of sauce and grilling for 5 minutes more to achieve the delicious browning and help the flavours set in. And yes, you will be tempted to double or triple dip your pinky into the dark depths of the sauce while you wait for the wings to cook. I confess to eating leftover sauce over steamed rice and a runny poached egg. Yum! Sprinkle the wings with a little salt and refrigerate for 15 minutes. Meanwhile preheat the oven to 200 degrees C and line a metal baking sheet with foil and lightly coat with cooking spray or oil. Arrange the wings in rows on the tray and roast in the oven for 20 minutes till golden brown. Turn the wings and roast for a further 20 minutes. Meanwhile make the sauce. In a mortar, pound together the coriander root, garlic, red chillies and chilli paste into a thick, almost homogeneous mixture. Heat a pan on low flame and drop in the butter followed by the mixture from the mortar. Now mix in the ketchup, soy, vinegar and fish sauce (if using) and simmer gently for 5 minutes. If the sauce is too thick, dilute with water as required. Remove from the heat when the sauce reaches the consistency of a thick yet smooth spread. Once the wings are golden and cooked on both sides,remove from the oven and turn on the broiler. Now baste the wings generously with the sauce and return to the oven to brown under the broiler for a total of no more than 5 minutes (this is to crisp up the wings but take care that they do not overcook and dry up). Serve with extra sauce on the side.